Mariners sent catching prospect David Banuelos to the Twins for $1 million in international bonus pool money. Jerry Dipoto isn’t going to talk anymore about his team’s pursuit of Shohei Ohtani. But the Mariners general manager’s actions speak volumes about their dogged pursuit of the most coveted free agent of the offseason. On Wednesday evening, shortly after holding a conference call with local media in preparation for next week’s Major League Baseball Winter Meetings where he would not discuss the Japanese phenom, Dipoto made a trade with the Twins to acquire additional international bonus pool dollars to enhance the possible bonus for Ohtani. “I know the questions you all want to ask regarding Shohei Ohtani, but at this time, I’m not going to make any comments on anything to do with Mr. Ohtani,” Dipoto said on the call. About an hour later, Seattle announced that it had sent minor league catching prospect David Banuelos to Minnesota in exchange for $1 million of the Twins international pool money. That additional money gives the Mariners a total of $2.55 million in their bonus pool to offer Ohtani. The Rangers still have the most dollars of the seven finalists at $3.53 million. The Angels also made a similar trade with the Twins on Wednesday evening, sending outfield prospect Jacob Pearson to Minnesota for $1 million in bonus pool money. That gives the Angels $2.315 million in pool money, according to Jeff Fletcher of the Orange County Register. The Giants, Dodgers, Padres and Cubs can only offer Ohtani a bonus of $300,000 because they exceeded their bonus pool under the previous collective bargaining agreement. Banuelos was probably the Mariners’ top catching prospect in their minor league system, certainly from a defensive standpoint. He was selected in the fifth round of the 2017 draft out of Long Beach State and signed for a $300,000 bonus. In his first pro season, he hit .236 (30 for 127) with eight doubles, four homers and 26 RBI in 36 games for Short-season Everett. His elite throwing arm and excellent blocking skills earned him a spot on the NorthWest League’s all-star team and made him one of the Mariners better prospects. A delegation from the Mariners met with Ohtani on Tuesday in Los Angeles at the offices of Creative Artists Agency. 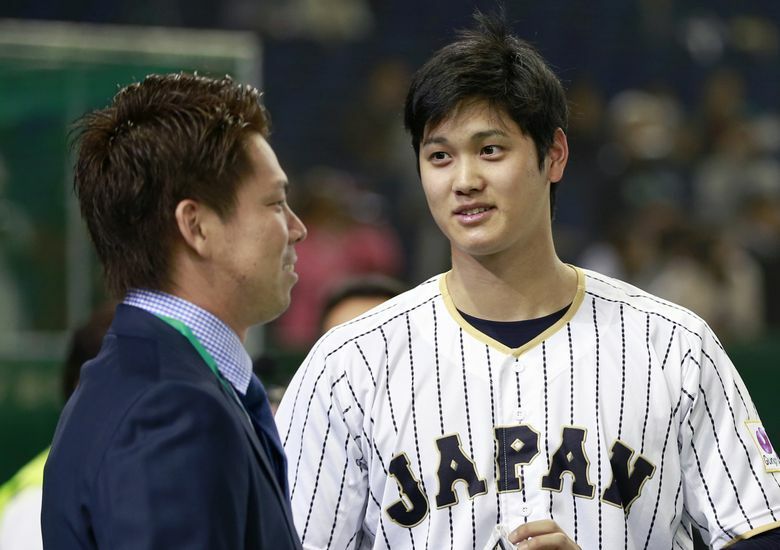 The Rangers, Cubs and Padres also met with Ohtani on Tuesday. The Dodgers, Angels and Giants met with him on Monday. Ohtani has until Dec. 22 to make a decision on what team he will select. Because he’s under age 25, he can only sign a minor league rookie contract, meaning he will make the league minimum for the first three seasons before becoming arbitration eligible. The international bonus pool money is the only additional dollars that teams can pay Ohtani. However, he has a slew of endorsements in Japan and likely will add more once he joins the MLB that help keep him well-financed.